Ouidad offers 5 Free Samples + Free Shipping On Orders Of $50+. Ouidad offers a Get 5 Free Samples + Free Shipping On Orders Of $50+. Ouidad offers the 15% off all jumbo sizes. Ouidad offers a 20% Off on Orders over $70 via code dm20. 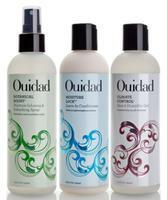 Ouidad offers the $10 Off $60, $20 Off $80, or $30 Off $100 with Your Purchase via code JUNECURL. Ouidad offers 25% off store wide via coupon code FFCURL13.